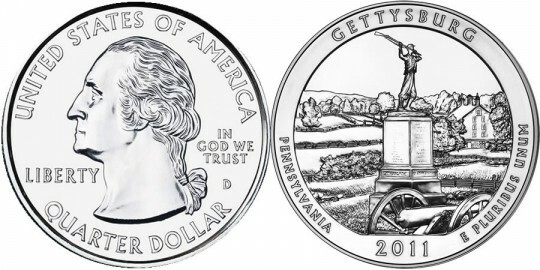 The 2011 Gettysburg Silver Uncirculated Coin was the first 2011-dated strike to appear in the series from the United States Mint. It honors Gettysburg National Military Park of Pennsylvania. Each coin in this America the Beautiful Five Ounce Uncirculated series is struck from five ounces of .999 fine silver to a diameter of three inches and feature an uncirculated finish differentiating them from the similar America the Beautiful Bullion Coins. That uncirculated finish is typically more detailed than the bullion strike. Another factor making the coins different is the inclusion of a mintmark on these strikes of 'P' which indicates they were struck at the US Mint's facility in Philadelphia. The bullion coins are also struck in Philadelphia but contain no mintmark. Gettysburg National Military Park was established by the War Department under the direction of Congress on February 11, 1895. It was created to preserve the site of the American Civil War Battle of Gettysburg which was one of the deadliest in the history of the war. 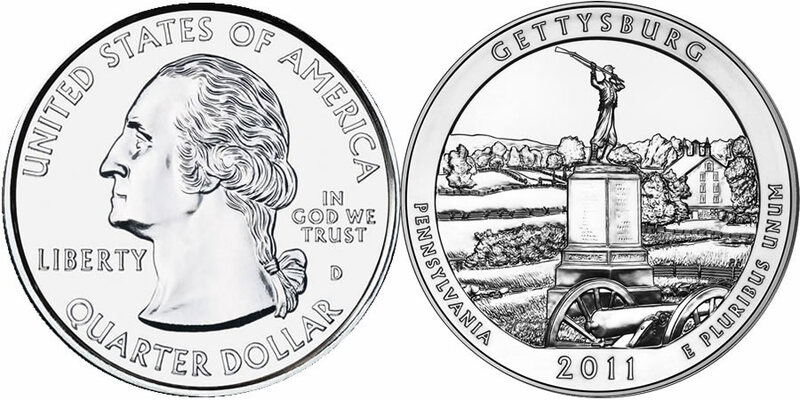 Based on the America the Beautiful Quarters® Program, the obverse of these strikes contain a portrait of George Washington, just like is found on the quarters. The portrait of the first President of the United States was designed by John Flanagan and is surrounded by the inscriptions of UNITED STATES OF AMERICA, LIBERTY, IN GOD WE TRUST and QUARTER DOLLAR. Emblematic of Gettysburg National Military Park of Pennsylvania, the reverse contains an image of the 72nd Pennsylvania Infantry Monument found within the park. Surrounding the image are the inscriptions of GETTYSBURG, PENNSYLVANIA, 2011 and E PLURIBUS UNUM. The reverse was designed by United States Mint Artistic Infusion Program (AIP) Master Designer Joel Iskowitz and sculpted by United States Mint Sculptor-Engraver Phebe Hemphill.